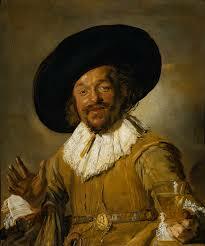 This is a portrait of an unnamed man, called in the title only ‘a merry drinker’. The background gives us no clue as to his location, filled in with flat wash of gold paint. He fills most of the canvas, from fore- to middle-ground, and seems to welcome the viewer, with a wave of greeting and a cheerful facial expression. The artist has made use of shadow only slightly, to emphasize the contours of the man’s face. The background recedes through his use of shading over a neutral ground that blends with the colors of the drinker’s clothing. The clothing – lace collar and cuffs, full sleeves with in-woven, or embroidered detail, gold medal, a belt worked with artistic embellishment, jacket with pleated (and, perhaps, gold-thread) adornment, a quite-large hat that could be made of black velvet – suggest a man of standing and some wealth. The Honour and Fleming World History of Art* identifies his medal as one of Prince Maurice of Orange, which “associates the drinker with the anti-burgher faction, which came near to converting the young republic into a monarchy,” (HF 591) so the artist would seem to have sympathy with this movement, as he has portrayed this man in such a pleasant light. Giving us the drinker as an anonymous ‘Everyman’ and placing him in a position of equality with the viewer with an attitude of frank goodwill, the artist would seem to communicate that the monarchy has a greater potential to support life, or to have a positive impact on ‘Everyman’ than the rise of the merchant class. This portrait is of a man grounded in this world (through earthy, ochre color, and through solid positioning right at the ‘proscenium’ of the frame), appreciative of the gifts of fine materials and wine, present to his fellow man. An artist with antipathy toward the monarchy would surely have placed him aloof and distant, with a close, or haughty expression, and in less earthy colors. Hals’ merry drinker is not sitting for a formal portrait, but seems to have been surprised in an unselfconscious moment of simple enjoyment of life. His glass of wine, or beer, is balanced strangely on his fingers, but he seems completely at ease and relaxed. The contents of his glass blend in with the palette of his clothing almost completely, suggesting that this drinking is an everyday aspect of the fabric of his life, rather than a special toast, or other formal occasion. Since the artist draws attention to the alcoholic beverage by the title of this piece, and in light of the other ways he places this ‘man of the monarchy’ on a level with the viewer (again, ‘Everyman’), he might well be communicating the idea that drink can be a leveler, or allow for bonding between various classes of people. I do not know about Hals’ views on Christianity, but this would seem to me to be consonant with a temperate appreciation for alcohol as a sign of the Holy Spirit’s influence upon unity and conviviality within the Body of Christ – as a proportioner, Who equalizes and unifies without the need of destroying either individuality, or hierarchical relationships within the Church. My initial response to this painting was simply attraction to this drinker’s merry joie de vivre, but I think the artist wanted to communicate a great deal more about the possibilities for harmony among men, made possible by acceptance of natural distinctions between them. Later developments in the movement from monarchs to merchants, from a continuous fabric of persons from king to peasant, to a stark division between capital-rich owners and industry-enslaved workers, make his observations all the more fascinating to me. Perhaps he over-idealized the possibilities for human dignity under monarchical rule, but perhaps republicans over-estimated the degree of human freedom that would accrue to ‘Everyman’ as the ceiling of authority was democratically lowered.